Both pro-Palestine and pro-Israel activists campaigned for four weeks over whether or not the referendum should be included. Students reached out to classmates, acquaintances, and even strangers to advocate for their cause, and when it came time for the SGA meeting, over 100 students packed into the Diana Center Café. Students fiercely debated the merits of the Boycott, Divestment and Sanctions (BDS) campaign—which calls for boycott against Israel until it meets what the campaign describes as Israel’s “obligations under international law”—along with the politics of Israel, and the Jewish experience itself. In the end, the referendum, which saw the highest voter turnout for any SGA election, passed with a 64.3 percent majority. 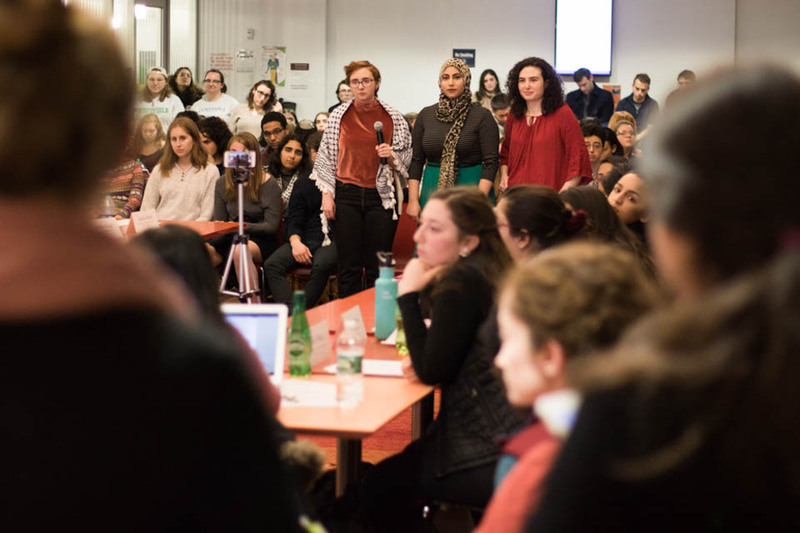 But before any statement could be sent to Barnard administration, and before the vote had even taken place, the college had already announced that it would not act on a vote to divest. Unlike many controversial political topics, the Israel-Palestine conflict is one of the few issues on which Columbia’s liberal-leaning community is polarized. For decades, the debate has permeated discussions across multiple facets of campus, including student government, academic settings, and apolitical clubs—even aspects of students’ personal lives. Most significantly, interviews with over three dozen students and faculty show that due to the pervasive nature of these discussions, community members fear social or academic repercussions if they associate with a particular stance in the debate. As a result, students in particular highlighted their discomfort with even being a member of certain clubs or taking certain classes. Moreover, students from all sides of the debate have criticized the administration for its stance in light of heightened tensions and increased advocacy, voicing safety as a primary concern and calling on the University to take steps to address potential threats. Pro-Israel advocates feel that not enough is being done to defend their safety and free speech on campus, an issue that has been heightened by recent anti-Semitic hate crimes nationwide and on Columbia’s campus. Meanwhile, Arab students expressed anxiety amid increasing Islamophobia nationwide—which has spread since the 9/11 terrorist attacks and has been further spurred by rhetoric and policies from the Trump administration decrying immigrants from Muslim nations—and have pushed for the University to show solidarity with Palestinians. Columbia itself has publicly refused to support efforts to divest from Israel, and Arab students have voiced concern that they lack the level of institutional support available to Jewish students. Even before the official international launch of the BDS movement in 2005, Columbia students urged the administration to divest from companies that sell arms to Israel as early as 2002, three of which were also listed in the 2018 Barnard referendum. The proposal was met with staunch disavowal from the University and wider community, and over 33,000 students, faculty, and alumni, signed a petition opposing divestment. “I want to state clearly that I will not lend any support to this proposal. The petition alleges human rights abuses and compares Israel to South Africa at the time of apartheid, an analogy I believe is both grotesque and offensive,” University President Lee Bollinger said at the time. While the student body’s position on this topic has shifted over time, administrative stances have remained the same. Barnard President Sian Beilock responded similarly during Barnard’s referendum last spring when she sent out an email prior to the SGA Representative Council’s actual vote announcing that the college would not act on the results, no matter the outcome. “I think it was a wake up call to a lot of students, that their voice didn’t really matter. … I can’t say it came as a huge surprise. … We generally expected the administration to be recalcitrant on an issue like this,” Students for Justice in Palestine member Nas Abd Elal, CC ’19, said. Due in part to its deeply personal nature, this debate has persisted within the student body and has lived on Columbia’s campus for decades, interwoven into various identities and political leanings. It has also often been the center of controversy. Six groups primarily dominate the conversation surrounding the debate: Students for Justice in Palestine, Jewish Voice for Peace, J Street, Columbia University Apartheid Divest, Aryeh, and Students Supporting Israel, which is a national organization. SJP, the most ardently pro-Palestine group, formed its chapter at Columbia in 2006 and has pledged full support for the BDS movement. SJP abides by an anti-normalization policy, which forbids the organization from recognizing or formally engaging with any Israeli or pro-Israel organizations. Similarly, Jewish campus organization Hillel refuses to host activities with organizations that support the BDS movement. The other major pro-Palestine group on campus is Jewish Voice for Peace, which established a chapter at Columbia in 2012. Unlike SJP, it does not abide by an anti-normalization policy, but it is firmly pro-Palestine, and also supports the BDS movement. Of the pro-Israel groups, J Street is most sympathetic to pro-Palestine sentiments. The organization supports a two-state solution, and labels itself a pro-Israel and pro-peace organization. J Street President Corinne Greenblatt, BC ’20 noted that, while the Jewish community includes a wide spectrum of opinions on the debate, there is an overall lack of Jewish institutions that allow for open discussion that includes pro-Palestine views. Like J Street, Aryeh—which formed in 2014, emerging from the now-defunct pro-Israel group known as LionPAC—firmly supports a two-state solution, though the group also emphasizes the Jewish right to self-determination, understood as support for the state of Israel. While JVP and SJP have close working relationships, as evidenced by their merging in 2014 to form Columbia University Apartheid Divest—a pro-Palestine group focused on supporting the BDS movement on Columbia’s campus—the pro-Israel groups remain divided over fundamental ideological differences. CUAD is most well-known for its annual Israel Apartheid Week demonstrations. In contrast, Columbia’s pro-Palestine groups describe themselves as closely aligned, not only with each other, but also with the other left-leaning activist groups on campus. CUAD’s petition to divest was endorsed by 14 different activist and cultural organizations, including Student-Worker Solidarity, No Red Tape, Black Students Organization, Columbia Divest for Climate Justice, and Columbia Queer Alliance. SSI President Dalia Zahger said that she believed the tendency for activist groups to be pro-Palestine can cause pro-Israel groups to feel isolated and unsupported by the activist community. “[SJP and JVP] started before [SSI] did and I think they've had an opportunity to approach those certain communities before we did. … I think it's just going to take probably longer to get to a conversation because the anti-normalization policy doesn't really encourage conversation or discussion, but hopefully, I don't think it should be us or them, I think there are certain topics that are open for everyone,” Zahger said. Even in largely unrelated contexts such as unaffiliated clubs and classroom spaces, some students said they feel uncomfortable due to their own political views. For example, activist organizations often distance themselves from Columbia University Democrats due to its perceived pro-Israel stance. “Within political and cultural groups, it’s definitely pretty divisive, especially with regards to students not feeling welcome in groups or students specifically not joining groups due to their stance specifically for or against BDS,” JVP member Jack Snyder, GS ’19, said. While pro-Israel students can feel isolated from the larger progressive Columbia community, pro-Palestine students feel marginalized and fearful of larger national Zionist organizations, which draw a unique level of national attention to the debate playing out on Columbia’s campus. Outside pro-Israel organizations such as the Canary Project and CU-Monitor create public blacklists of professors and students who they deem anti-Semitic, which can affect not only future job and academic prospects, but also put those listed at risk of harassment. At times, these organizations organize protests on Columbia’s campus—one earlier this semester drew members from the Jewish Defense League, a pro-Israel group recognized as a terrorist organization by the FBI. Other groups, such as Alums for Campus Fairness or Students & Parents Against Campus Anti-Semitism, also often lend support to pro-Israel groups, while there are no support groups with comparable national reach for Columbia’s pro-Palestine student activists. “If you’re in pro-Palestine groups, the reason you don’t want to be on some of these lists is because certain employers, maybe law school, even certain academic institutions, will hold that against you. … I know a lot of people in JVP—this is in the past, they’ve graduated—their parents don’t know that they’re a part of this, they don’t want their employers to know, members of SJP too, because that could be held against them,” CUAD member Zak Aldridge, CC ’19, said. The tendency to conflate Zionism with Judaism and anti-Zionism with anti-Semitism further complicates the debate and the relationships between those involved. The debate arose most recently when SGA delayed signing a statement of support for the Jewish community following the mass shooting in a Pittsburgh synagogue in October that claimed the lives of 11 people. Many students speculated that the cause for this delay was due to a reference to Israel in the statement. SGA denied this allegation, issuing its own statement condemning anti-Semitism four days later, and eventually signed the original statement of support. However, the conflation of the Jewish identity and the Zionist identity has pervaded the student body’s conversation surrounding the Israel-Palestine debate. Jewish students have voiced feeling unsupported by the Columbia community at large, pointing to the fact that the left-leaning students can be slow to show support to Jews for fear of being associated with Zionism. Specifically citing the Pittsburgh shooting, many students criticized the University for originally failing to identify the shooter’s anti-Semitic motives in a statement released to the community the day following the attack. Certain pro-Israel organizations and individuals also cite the University’s reputation as a leader in Palestine studies as evidence that Columbia’s campus is hostile to pro-Israel students. Professor Edward Said, founder of the field of postcolonial studies and staunch pro-Palestinian advocate, was a scholar at the University. Columbia was also the first and one of the only universities to launch a Center for Palestine Studies—a fact that pro-Israel organizations have criticized perennially. At the same time, many pro-Palestinian advocates feel like their speech and advocacy for Palestine is twisted into anti-Semitic rhetoric. “I think in general, people are seeing the difference between anti-Zionist advocacy and anti-Semitism more and more. It's all there to be seen, it's just a matter of putting the dots together, which for most people is when they see that neo-Nazis are responsible for the vast majority of attacks against Jews and other extremists are responsible for the remainder. And the reason the only ones making the conflation are Zionists is because it’s a cheap way for them to pivot off of a tragedy to buttress their ideology,” Aldridge said. Pro-Palestine students noted that they faced greater dangers advocating for Palestine than their pro-Israel counterparts due to the large national support of Israel. Israel is the largest recipient of aid from the U.S., provided a cumulative $134.7 billion since World War II. Pro-Palestine students further cited the imbalance in power between pro-Palestinian and pro-Israeli forces as a cause of fear—both on a national scale, with large lobbying groups such as AIPAC, as well as on a university level, comparing the size of the Kraft Center to the Center for Palestinian Studies, which has no funding or individually-dedicated building. A landmark moment occurred in 2004 when the David Project, a pro-Israel agency of Hillel International devoted to fostering relations between student leaders of diverse organizations that support Israel, released the documentary, “Columbia Unbecoming.” The documentary openly condemned Columbia for allegedly fostering and protecting anti-Semitic professors, specifically citing professors in the Middle Eastern, South Asian, and African studies department. The University responded with a year-long interrogation of the MESAAS Department by an ad hoc committee formed by President Bollinger which found, “no evidence of any statements made by the faculty that could reasonably be construed as anti-Semitic,” and recommended no punitive action. The MESAAS Department is still commonly cited by pro-Israel groups when trying to prove Columbia’s reputation as an anti-Semitic university. Of the 54 professors in the department, 12 have been accused of anti-Semitism on the hardline pro-Israel site CU-Monitor. Of the almost two dozen MESAAS departments reached for inquiry by Spectator regarding this topic, no professors were willing to respond on the record. The Algemeiner, a pro-Israel online news source focusing on Jewish and Israeli news, rated Columbia as one of the “worst campuses for Jewish students” in both 2016 and 2017, contributing to its image within the Jewish community as an unsafe campus for Zionist students. “We are getting dozens and dozens of calls asking us which campuses are safe for Jewish students, or non-Jewish students that are pro-Israel. … The questions are no longer, ‘Which are the top schools?’ ...The question these days is, ‘Which are the safest schools?’” Shoshana Bederman, a member of the New York chapter of Students and Parents Against Campus Anti-Semitism, said. Students who identify as Jewish or Arab also find themselves being pulled into the center of the debate simply due to their identities. According to Turath Vice President and member of SJP Tara Matalka, Arab students feel like they have to be involved with this issue not only due to the politicization of their identity, but also due to their proximity to the issue. Turath, “a nonpartisan undergraduate student association that serves to promote Arab culture at Columbia,” took an official stance on Israel-Palestine four years ago. “Our identity is inherently politicized. ... I’ve yet to talk to an Arab that doesn’t take a stance, or doesn’t have somewhat of an opinion. [Some] Jewish students—they have no proximity to the issue,” Matalka said. Similarly, the Jewish community has a wide spectrum of opinions regarding this issue. Some students choose to disengage, while others choose to become deeply involved. Some Jewish students feel that Israel is integral to their Jewish identity, while other Jewish students don’t feel personally connected to Israel. “I kept to myself on most of these [discussions]. It’s not that I’m trying not to be informed. ...The rhetoric is certainly intimidating, it’s emotional for everyone involved, so I just think it’s best to keep to myself on those issues,” said Blythe Drucker, BC ’21, a Jewish student who considers herself a casual Hillel member, but not particularly involved in any Jewish groups on campus. Like other universities, Columbia has garnered international attention as a place for the Israel-Palestine debate to play out in real time, drawing the attention of activists, pundits, and scholars on all sides of the issue. “The fact that college campuses are seen as a very contested and important battle ground, Columbia in particular is considered a battleground campus [for this issue]. … People view college campus as the first place to perceive [ideological] shifts, especially amongst younger generations,” Abd Elal said.